Automatically start your webinar registrants on a follow-up campaign. Zapier can add or update contact records. Hatchbuck can then trigger your event-based campaign to send Go-to-Webinar registrants information before and after the event. Don’t forget to send a targeted follow-up campaign to build on those relationships. Once a customer completes your survey on SurveyGizmo or SurveyMonkey, Zapier can add a tag to the survey taker. That way, you can stay organized, send any follow up communications (like a tasty treat as thanks – we love sending our customers digital Starbucks giftcards) or avoid sending another ask to complete the survey. 3. Chatting with new prospects? Chat tools are a great addition to your website to answer any questions a visitor may have on the fly. Some people may be too busy to give you a call, but chat tools allow a quick and easy form of communication. 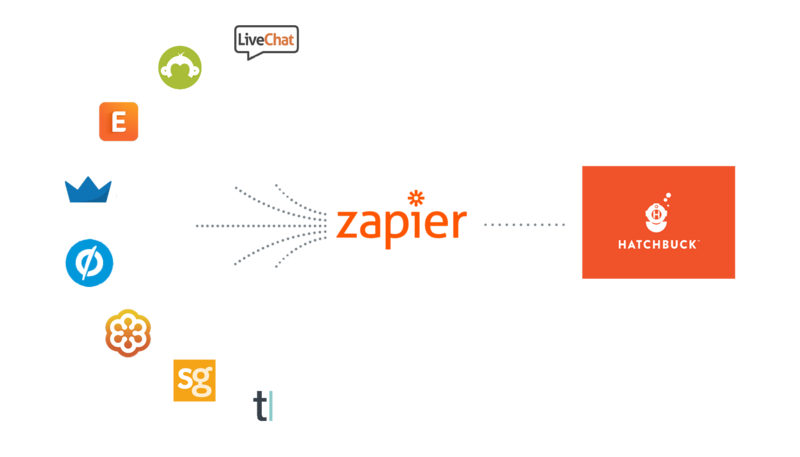 When you capture the information of a new prospect on a tool like Pure Chat, Zapier can add these contacts into Hatchbuck automatically for you. No more data entry! 4. Land a new customer? You’re in business to build and follow your dreams and passions. You’re also in business to make the benjamins. As you receive payments from your new customers in PayPal or Stripe, Zapier can add new contacts and a tag. Using this tag, Hatchbuck can send your new customer some love. Send your repeat customers extra love by setting up a tag rule in Hatchbuck that will take note of how often you receive a payment in Paypal or Stripe. After an awesome event, send a thank you email including photos. Zapier tagged all the Eventbrite attendees for you making your follow up easier than ever. 6. Creating a pop-up lead magnet? If you have awesome resources on your site to entice leads to leave their information, you’ll want to pull them in so you can start nurturing them into customers right away. Zapier can create new contact records in Hatchbuck after your website captures those leads using SumoMe. That way you can then automatically trigger a targeted nurturing campaign. Win-win. Marketing automation isn’t just for big enterprise companies any more. With the new Hatchbuck and Zapier partnership, there are many Zap recipes you can easily create to start hooking in all your moving parts into one platform. For more ideas on how to connect Hatchbuck to the apps you use and love while automating your workflow, check out our Zapbook. Less data entry, more time for doing what you love.